So, the day that sometimes involves turkey, family, and pumpkin pie is looming on our horizon next week. Some people in our country will have enough to eat. Others will be homeless and without enough. Some will spend all day cooking for family. Others will spend the day serving a meal at a community center. There will be Black Friday shoppers and Black Friday boycotts. The uncomfortable truth of the land theft and genocides that founded the United States will go largely unacknowledged. 1) Be grateful. Be truthful. Be both. Acknowledge the places of plenty. Acknowledge the places of scarcity, lack, injustice, and pain. All of them need our awareness and attention. 2) One way to acknowledge the hard truths of our nation’s founding is to know the name of the tribes who originally inhabited the place that you will be standing on November 24th. Do a bit of research if you don’t know. Find out where you stand. Learn where the tribe is today. Some have been destroyed, but many remain. If you are gathering with people who are sharing a feast on November 24th, share this information and perhaps set an intention to work toward better respect and relationship with the original inhabitants of North America. 3) Be generous with time, money, food. Share with others. While Black Fridayhas turned into a hyper-consumeristic feeding frenzy, many people either boycott the blatant consumerism or choose to make donations to social justice organizations or nonprofits. Turning gratitude for plenty into action towards ensuring that everyone has enough is a good practice for all of us in the Live Share Grow movement this week. 4) Food. 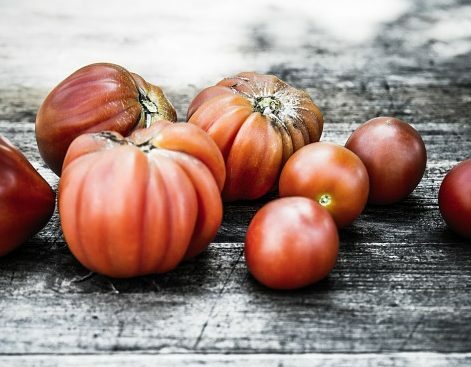 If you can, where you can, look for local vegetables, etc. if you are celebrating with a feast. 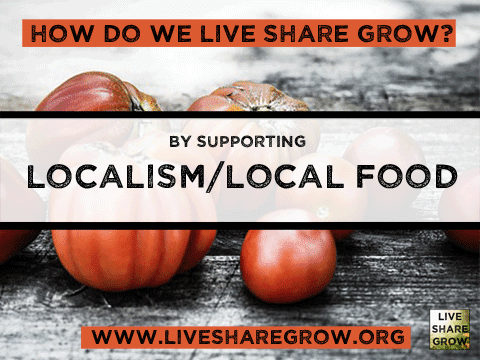 Every dollar you spend on local food helps to create greater economic justice, protect the environment, and build more resilient communities. Thanks! Beyond those thoughts, here’s two more to consider. Chuck Collins and the Institute for Policy Studies are releasing a report on charitable giving. As you might imagine, growing inequality also reflects in the charitable donation sector. Wealthy people are getting richer, and giving more (though not necessarily by percentage of net worth). The rest of the people are seeing stagnant or decreasing wealth, and giving less because of financial constraints. This creates a challenge: the wealthy are setting the agenda of charities and nonprofits. While some of those choices are commendable, others are questionable. In either case, the nonprofit and philanthropic sector of our economy is being shaped and driven by the 1%. But what about the visions and dreams of everyone else? In his new book, Born On Third Base, Chuck Collins writes about ways that philanthropic giving can be shaped by the knowledge and needs of a broader spectrum of people. So, there’s some light reading for your long weekend. Also! 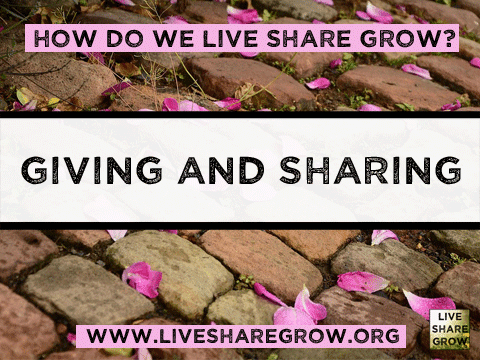 We were asked, “How does one issue the Bold Invitation to Live Share Grow?” Great question. 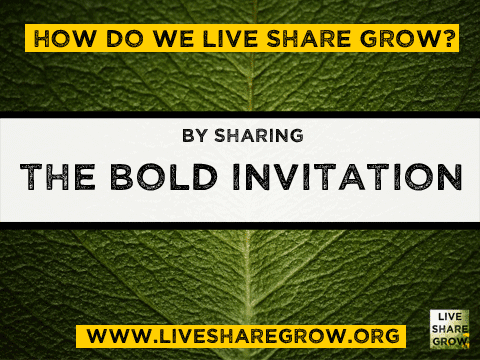 We use the Bold Invitation in a variety of ways: online to post on social media or email to friends to introduce them to Live Share Grow, offline with a spoken version that we just use as a framework for inviting people to find out more about the movement; and with a printed handout that we share with people who want something to read. The Bold Invitation is adaptable, and the basic idea is, “We are boldly inviting you (whomever you are) to work towards greater economic equality and resilience in our communities and world.” Here’s where to find our online version of The Bold Invitation. Keep up your great work and share your stories with us! With love, Rivera, Dariel, Chuck, and Live Share Grow!